Some documents are greatly enhanced by the addition of clear, simple diagrams. If your work is in the natural sciences, visual illustration can be especially helpful. You can photograph something like a tiny insect, for example, but it is difficult to show all surfaces. You might, on the other hand, want to demonstrate the difference between the ‘front’ (ventral) and ‘back’ (dorsal) surfaces, all within one drawing. Or you might prefer to leave out some features and emphasise others. Good line drawings can do this for you. Scientific illustration typically uses clear lines, is accurate and to scale, and includes those features that are important to illustrate a point. The following drawing is of a mite (Trixacarus caviae from a guinea pig). 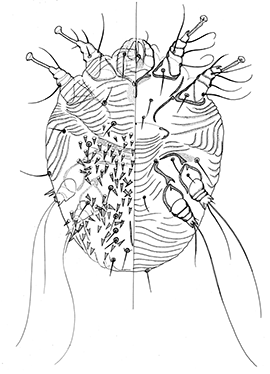 Note that a line divides the mite in half, and both surfaces of the mite are shown. This drawing was produced by Sally for a publication about mange in guinea pigs. If you need a diagram for your publication, I typically require some examples of what the subject looks like. I can work with photos, drawings and/or actual specimens. The more material I have as examples, the better the diagrams! I study these and produce a line drawing in pen and ink to show the important features. I then scan the original and work with an electronic file to add shading, labels and anything else you require. Here’s an example: You may be using a map to show distribution of a particular species. After scanning the drawing, I use Photshop to produce miniature versions, repeated on the map in the locations for that species. I can also produce more ‘artistic’ illustrations in pen or pencil and watercolour. These are not always suitable for use in scientific articles, but can be an assett in books and other publications. In these contexts, strict diagramatic style is not always needed. 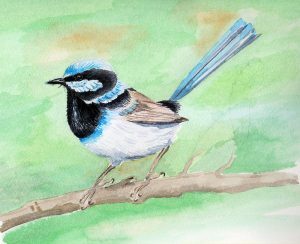 If you would like to illustrate your work with one of my diagrams or watercolour paintings, please contatc us to discuss your ideas. Over the last 10 years I have kept going back for illustration consults with Sally because she has the skill to create that perfect image to accompany a publication. I have included pharmacokinetic images in the Journal of Pharmaceutical Sciences and the journal of the World Organisation for Animal Health. In addition, I have a series of animal species illustrations for use in the online Veterinary Clinical Pharmacology Network. Always fantastic images, she takes the time to find out what is required and tunes and fine tunes each piece until it meets that original mental image. To discuss whether your publication would benefit from scientific illustration, contact us.